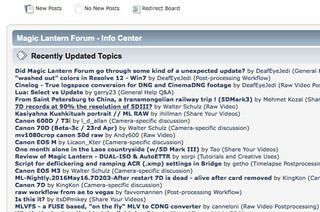 Because for years we have been able to go to 'Recent unread Posts' and 'Show new replies to your post' on the usual top left corner of the ML Forum webpage. It's almost completely useless on web pages as it's forcing ourselves to go under Forum and scroll down and manually find out which one is which. Is there a reason why that these two links got taken down or is it a bug? Unreported or not but I think we should be able to get them back at the very least. It just basically slows down my work and being able to keep up with you guys is much more difficult without having those two suitable buttons to links. Anyone else dealing with this in an unexpected similar situation as well? Until then I'll be using Tapatalk in the meantime as I obviously prefer to do this kind of work on the web page (Macbook, Mac, etc) whenever I can. 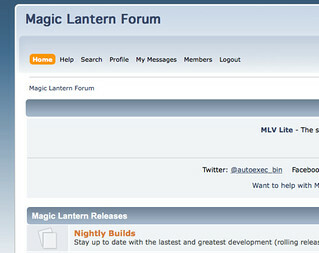 Re: Did Magic Lantern Forum go through some kind of an unexpected update? It is working for me. Yesterday though I needed to login although I had set my login forever. Besides that I saw nothing different. Mine is still there, try shift refresh to completely reload the page, maybe you accidentally blocked that div area. However, the past few days when I click on "show new replies to your posts" it's been completely empty, but maybe none of the posts have had comments made in them for a while. Can anyone at least post a screenshot of their web page showing those two links on top left corner for verification purpose, please? I'm going insane in here and don't understand why it feels like I'm the only that is being affected? Tired of using Tapatalk when I'd rather be on the web via computers, etc. it's just easier that way and when will it all go back to normal ... At least for me? Do these links work for you? If so, just bookmark them. Thanks, David, for the hints. I figured I could have done that but to be honest it's just impractical to do. I only was able to save this particular screenshot from TODAY (randomly) because I signed out and tried logging back in but then I got that '30 second please wait' error (see photo above). Which then eventually I was able to log back in just fine but now it's back to the blank area on the top left corner. I want this to be back to normal. Seriously what the hell is going on in here guys? Yes I see the links just fine, and in every major browser. I don't understand how bookmarking these links is impractical. IMO, it's actually far more practical. You can go straight to them without going to the main page first. This is what I do, I always go straight to the recent unread posts page. I see the links just fine. Every major browser on all of my 3 Mac's as well as PC's that I use at work. Whether it's Safari, Chrome, I.E., Opera, etc ... It's still not showing me these two usual links on the top left corner that you all are supposedly able to see just fine but I can't? Computer firewall? Router firewall? Restart router? Clear cache? Not sure if any of them would help, but I'd give them a go. Top right corner next to 'User Guide' there is a white arrow. Click it. @dmilligan is right. That is when the two links disappear. And reappear. What a simple solution! I've missed the "unread posts" link for about a year now, but never dared to ask. Ah, HA ... I knew it was going to come down to this moment where I can just be like D'OH and how could I've missed that little tiny Arrow on the far right top corner which would then finally give me those much needed two useful links. Bottom line, I didn't mind to bite this one and take the embarrassment because I knew it would then not only help myself but others as well. Still to this day I do not how did it disappear on its own (I know for a fact I didn't accidentally touched that white arrow previously as I never knew it existed) and then with it happening on every browsers (both Mac and PC) which was driving me insane. Thanks again, David, for your educational tut's that never stops coming when in need. Glad for those that were able to at least gain something out of this thread! Cloud synchronisation is most likely the culprit here. LOL. Did not even know that existed. Points for useless forum features (undoubtedly put in by the forum itself, not ML). I'd like to point out that I didn't actually find this arrow until I manually inspected the HTML source of the page looking for divs that could be hidden. Well at least you helped me and obviously others as well. Thanks for the tip on the hidden div's!